Post: What's the Role of a Hospital? 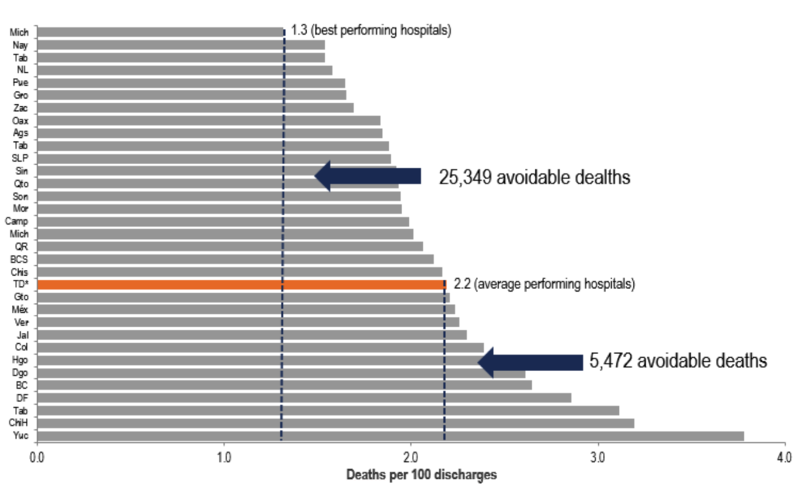 Around the world, heaps of anecdotal evidence suggest a link between hospital neglect and serious consequences: wasted money and preventable deaths. And thanks to a brand new report from Mexico’s Ministry of Health, we have some firm numbers from one country to support this common-sense connection. At a CGD event earlier this month, Mexican Undersecretary of Health Eduardo Gonzalez Pier announced that the Ministry has launched it’s first-ever hospital performance report. This landmark document benchmarks hospitals across Mexico to assess overall performance, identifies gaps in quality and efficiency across states and facilities, and suggests areas for enhanced investment to improve patient outcomes and value for money. The report is an important step for Mexico to improve its health system—and it also sets a powerful example for other low- and middle-income countries that need to improve their hospitals but lack the data to catalyze change. The report’s findings are startling. For instance, if the hospitals in the worst-performing states were improved to match the performance of hospitals in the ‘average’ state, Mexico could prevent nearly 5,000 unnecessary deaths each year. And if Mexico could make hospitals in those same states equivalent to its hospitals in the best-performing states, it could avoid about 25,000 unnecessary deaths each year. For a sense of scale, there are an estimated 150,000 deaths each year in Mexico caused by neonatal disorders and cardiovascular issues among adults—both of which are used to measure the quality of hospitals and health care in Mexico’s report. Hospital improvements could also help with the Ministry’s bottom line. If hospitals in Mexico’s worst-performing states became as efficient and effective as hospitals in the average state, they could save nearly $90 million and prevent 66,000 avoidable hospitalization days per year. Get those same states to match the performance of Mexico’s best states and savings could exceed $260 million and 195,000 hospitalization days each year. Those wasted resources could be used to improve other aspects of Mexico’s health system—and the health of Mexican citizens. The inefficiencies of hospitals in Mexico are indicative of a problem that exists in many low- and middle-income countries—we just don’t often hear about it because, unlike Mexico, other countries have not yet assessed the performance of their hospitals and hospital system. The Global Hospital Collaborative recommended in our new report, Better Hospitals, Better Health Systems, Better Health, could help countries undertake this type of assessment. Mexico appears to be ahead of the curve, and other countries should take note of the essential steps the country is taking. Mexico’s Ministry of Health should also continue to share its experience and findings with other countries. The Collaborative could be a useful tool in this effort by creating a venue where hospital-related policy, data, research, and best practices can be shared across country borders. And, in the long-term, measuring hospital performance and responding adequately to hospital needs could become the norm. As Gonzalez Pier and others noted at the launch event for our report (watch it here), and as the report itself discusses, hospitals are not explicitly on the policy agenda of most health ministries—but they should be. Hospitals have been around for hundreds of years, yet in most countries we still don’t have a good understanding of their impact on health. It’s time that changed. Better advocacy is needed to motivate policymakers, donors, payers, suppliers, and hospital managers to collect and analyze the requisite data and make the necessary improvements. And at the global level, we all could do a better job advocating for hospital improvements. As Maureen Lewis pointed out on our blog, hospitals are an essential component of universal health coverage, a target of the SDGs. I hope to see conversations stemming from the recent Universal Health Coverage Day feature hospitals more prominently as a strategy to save money and save lives.